Significant bills for unpaid NI and fines for non-compliance, plus future payroll costs increased by 40%. An increase in administrative and regulatory burdens. There has, for many decades, been conflict between the UK tax authorities and the Construction Industry over the Employment status of workers. 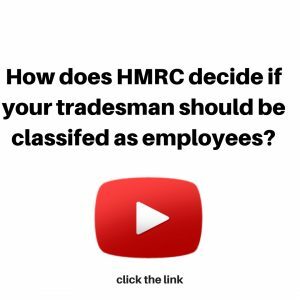 HMRC treats all self-employment with suspicion viewing it not as a legitimate choice but often as just a ruse for avoiding tax and national insurance. This suspicion is amplified when they look at the building sector because there are, quite properly, roughly five times more people working under self-employed contracts in construction than in any other industry. HMRC Onshore employment intermediaries: false self-employment consultation. In the ever-constant quest for the greater extraction of tax, they frequently question the legitimacy of the long-term engagement of tradesmen, particularly for the SME builder, as simply not appropriate. To back up their arguments for reclassification HMRC’s approach can be summarised by four simplistic tests, the failing of which could lead to a status review. Does the sub-contractor supply all his own materials, plant and equipment? Does sub-contractor employ other sub-contractors? Can the sub-contractor demonstrate that he can make a loss as well as a profit? Can the sub-contractor demonstrate that he has an active portfolio of clients? If the answer to the majority of these questions is NO then HRMC are extremely likely to classify the engagement as employment, not self-employment. The impact of this on the employing contractor can be disastrous; back dated bills for unpaid National Insurance contributions, fines, and interest. By appointing EEBS as the supplier of your sub-contract labour, you create a firewall that prevents HMRC from reclassifying your self-employed sub-contractors as employees. EEBS have dozens of clients who have been inspected by HMRC whilst using our services, and our business model has never been challenged. Other benefits of appointing EEBS to engage with sub-contractors on your behalf include protecting your business from Employment Rights claims, i.e. holiday pay, pension contributions, unfair dismissal, discrimination and parental rights.